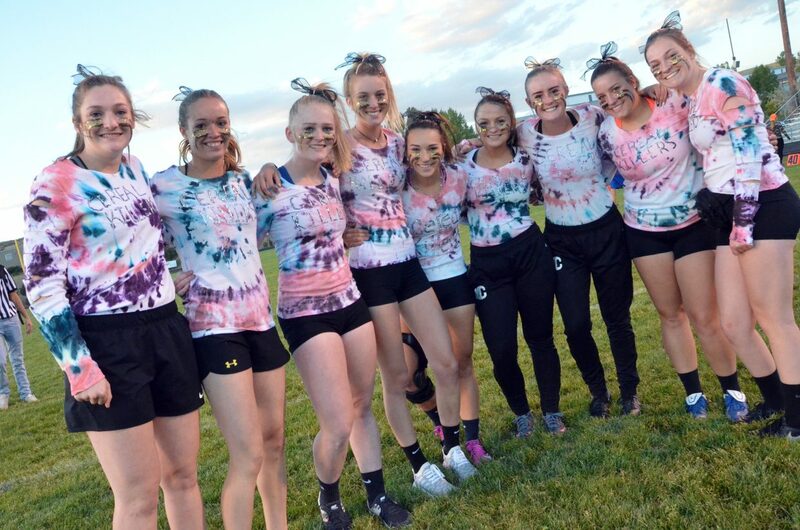 Cereal Killers celebrates their win of the 2018 Powder Puff Football tournament Monday at Moffat County High School. Top row, from left: Bailey Lawton, Faith Morgan, Terry Gillett, Ebawnee Smercina, coach Jared Baker, coach Josh Teeter, referee Victor Silva, coach Cale Scranton, ref Tyler Fortune, fan Trinitie Beckner. Bottom row: ref Logan Knez, Tiffany Hildebrandt, Madie Weber, Kinlie Brennise, Quinn Pinnt, Jaidyn Steele. The members of Cereal Killers ready to take the field before Moffat County High School's Monday Powder Puff Football. 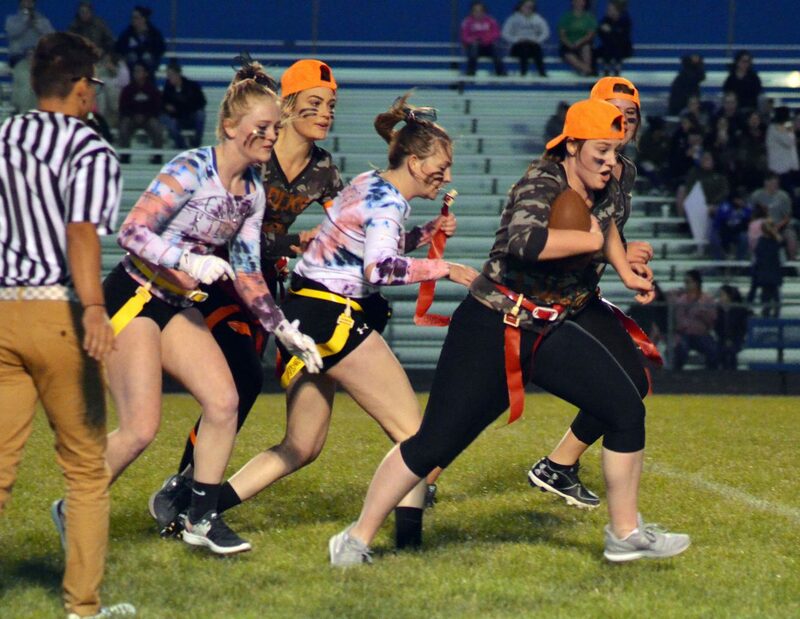 Darbi Zimmerman, of Locked & Loaded, fakes a carry to divert attention during Moffat County High School's Monday Powder Puff Football. The members of Locked & Loaded gather on the field before Moffat County High School's Monday Powder Puff Football. 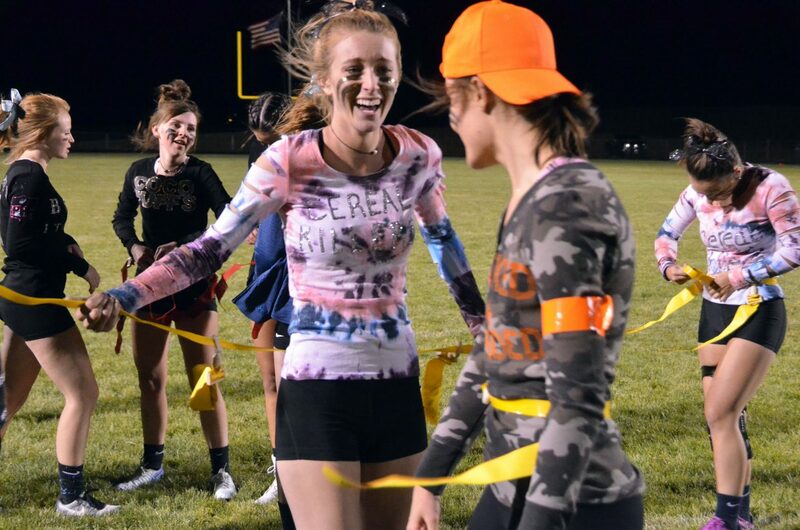 Players switch flags and share a laugh between rounds during Moffat County High School's Monday Powder Puff Football. 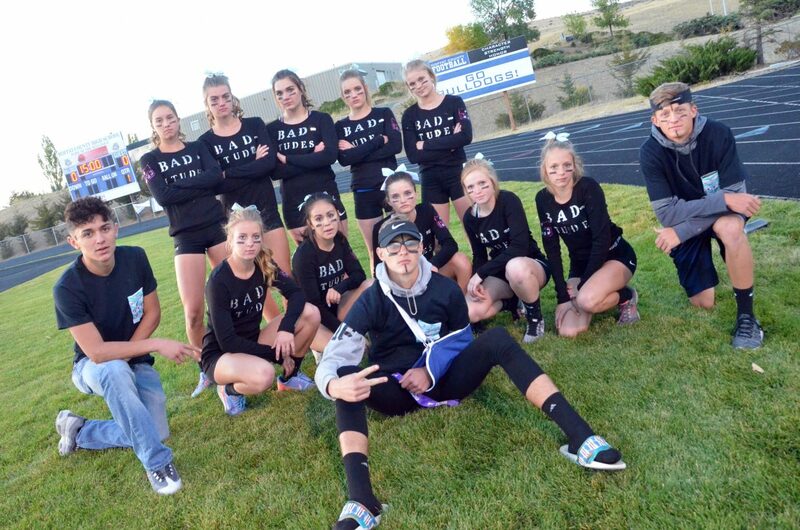 The players and coaches with Bad-Itudes are ready to get physical for Moffat County High School's Monday Powder Puff Football. 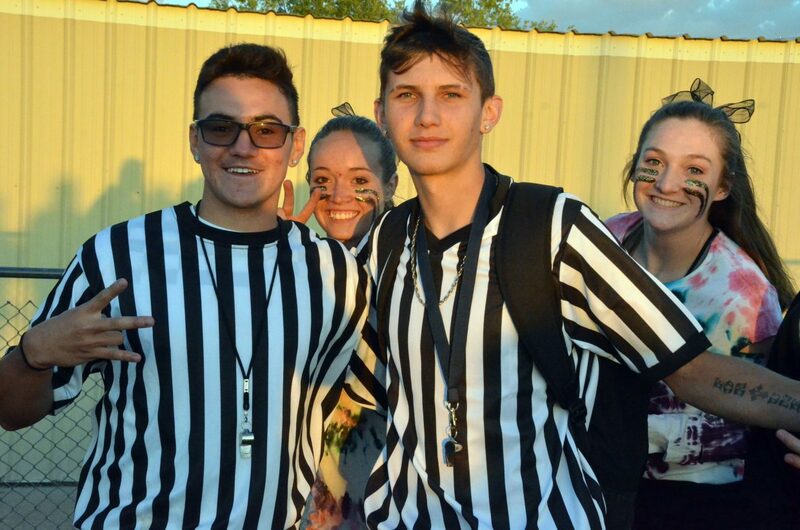 Madie Weber and Tiffany Hildebrandt photobomb referees Victor Silva and Tyler Fortune before Moffat County High School's Monday Powder Puff Football. Reese Weber, of Bad-Itudes pulls in an interception during Moffat County High School's Monday Powder Puff Football. 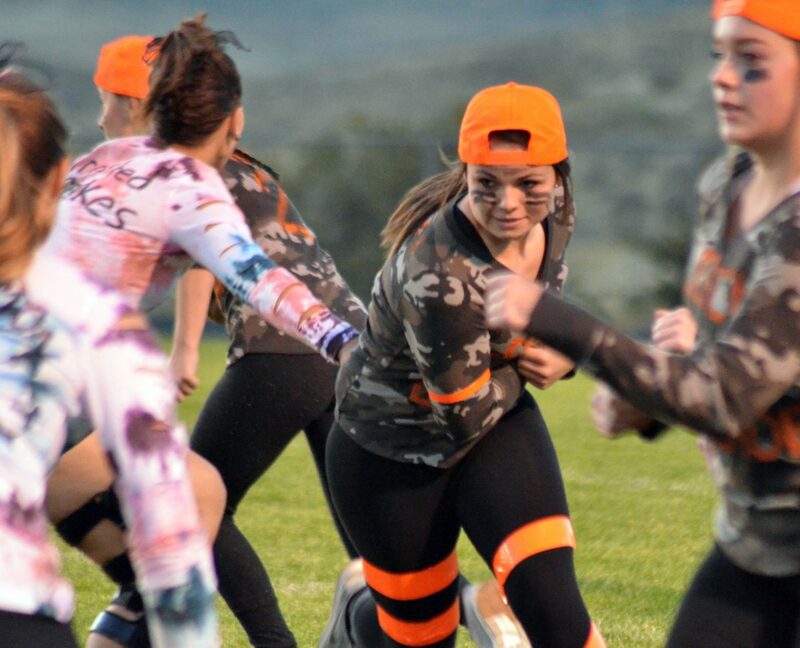 Cereal Killers' Jaidyn Steele looks for a couple more yards against Locked & Loaded during Moffat County High School's Monday Powder Puff Football. 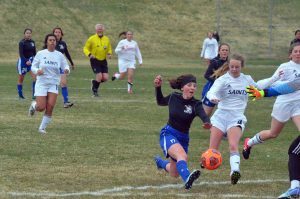 Madie Weber, of Cereal Killers, speeds to the goal line during Moffat County High School's Monday Powder Puff Football. 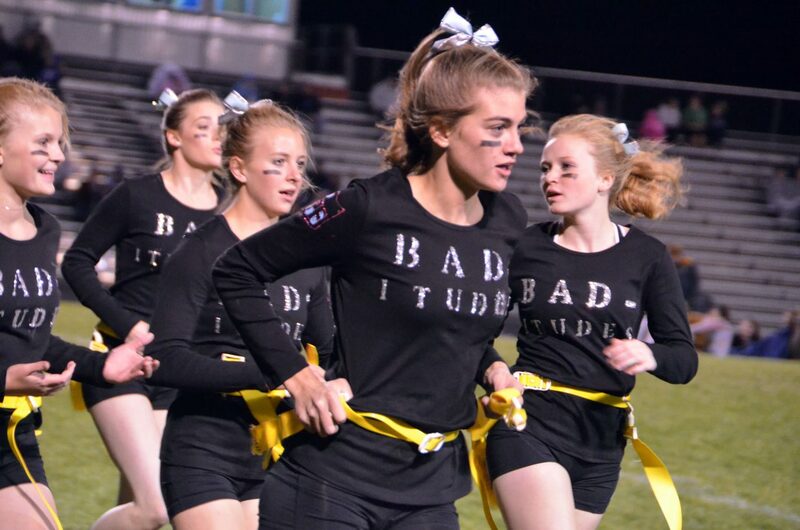 Members of Bad-Itudes head off the field for a timeout during Moffat County High School's Monday Powder Puff Football. Members of Coco Puffs come off the field for a huddle during Moffat County High School's Monday Powder Puff Football. 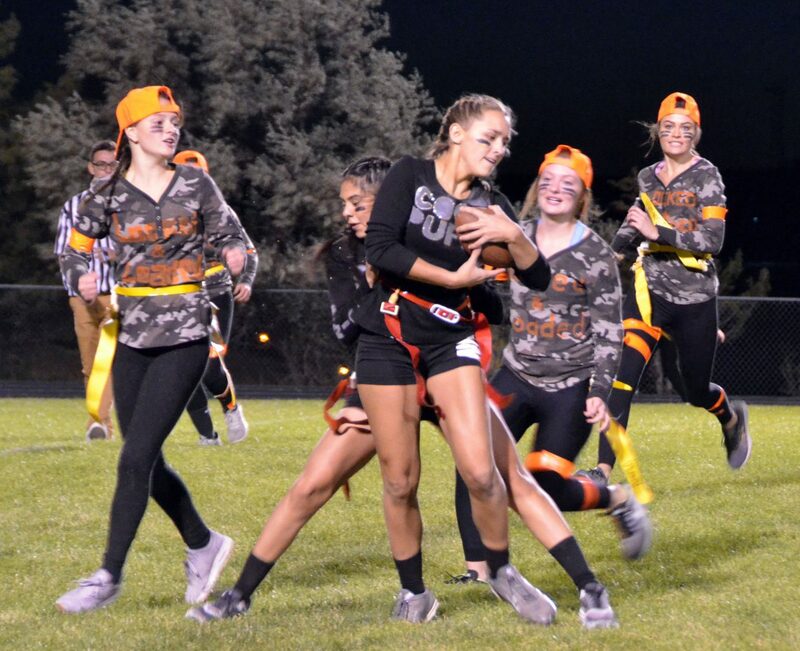 Makayla Martinez, left, and Emma Jones show off their specialty logo for the night during Moffat County High School's Monday Powder Puff Football. 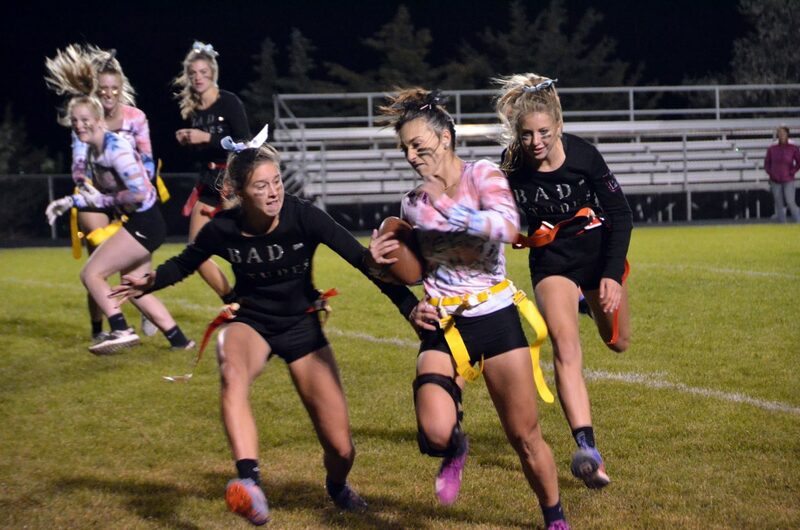 Coco Puffs' Kayla Hampton looks to get away from the Locked & Loaded defenders during Moffat County High School's Monday Powder Puff Football. Bad-Itudes' Stephenie Swindler swings out wide during Moffat County High School's Monday Powder Puff Football. 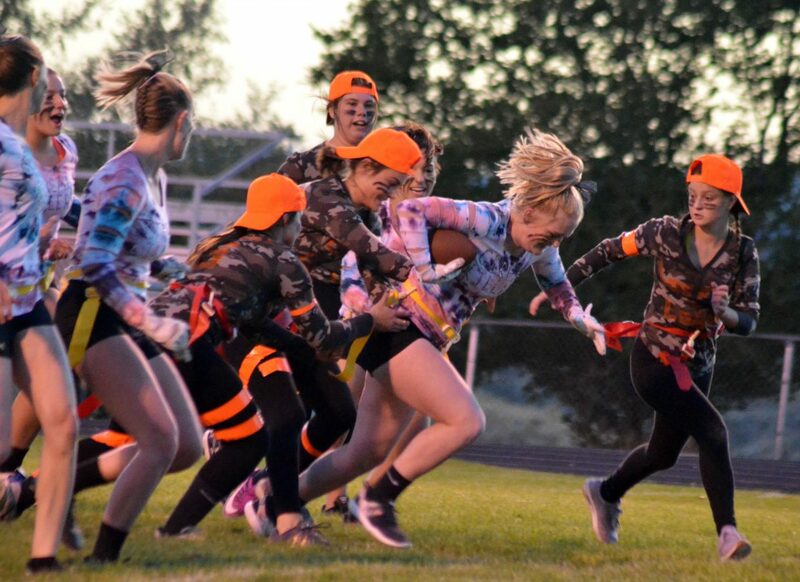 Cereal Killers' Quinn Pinnt pushes forward during Moffat County High School's Monday Powder Puff Football. 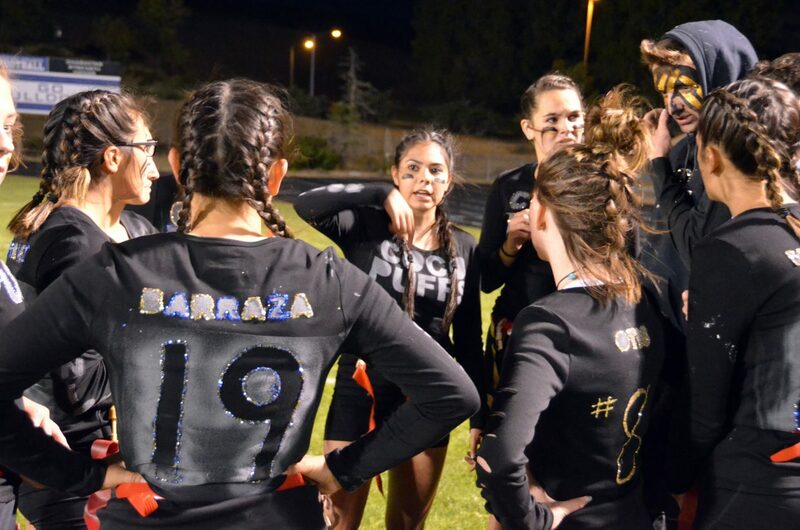 Members of Coco Puffs discuss tactics before the next round of Moffat County High School's Monday Powder Puff Football. 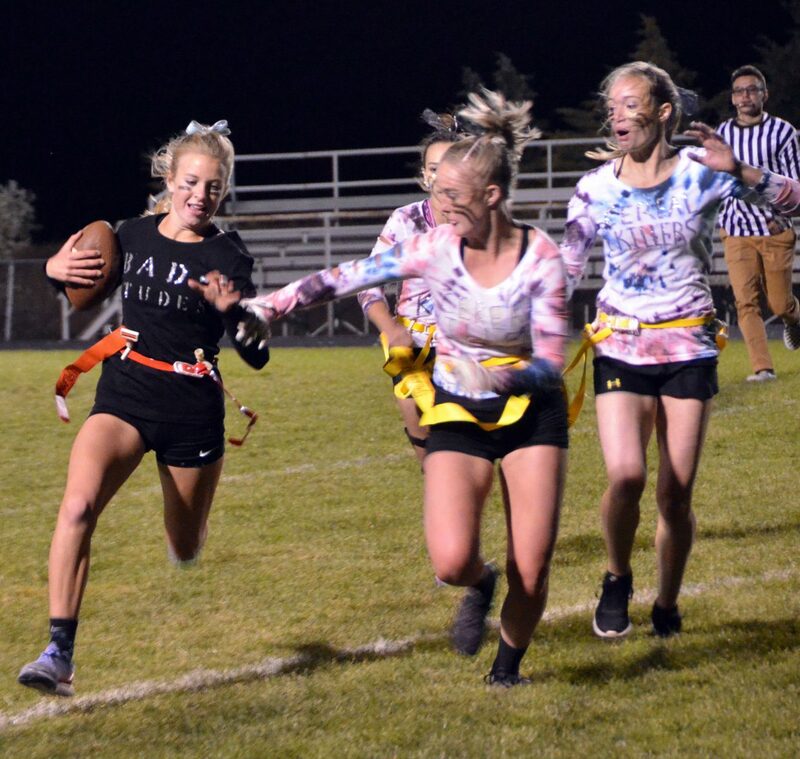 MaKala Herndon, of Locked & Loaded, keeps moving late in the game during Moffat County High School's Monday Powder Puff Football. 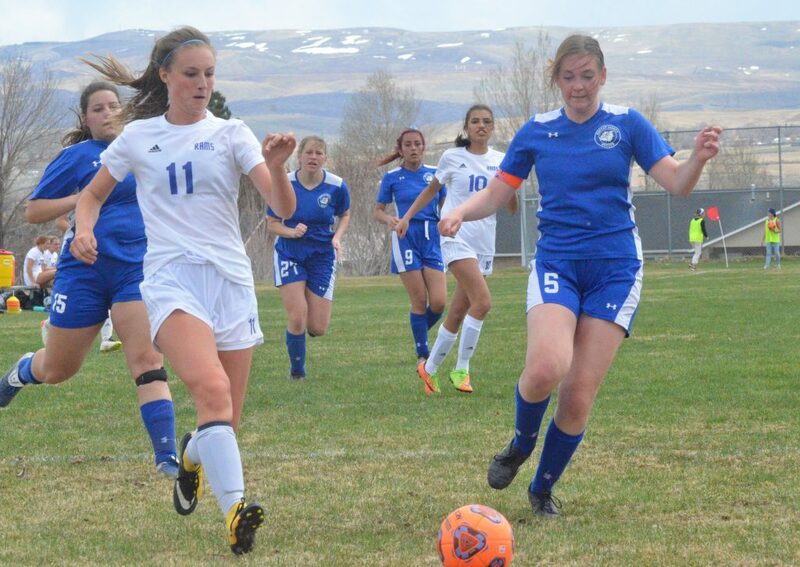 Coco Puffs' Jackie Barraza advances upfield during Moffat County High School's Monday Powder Puff Football. 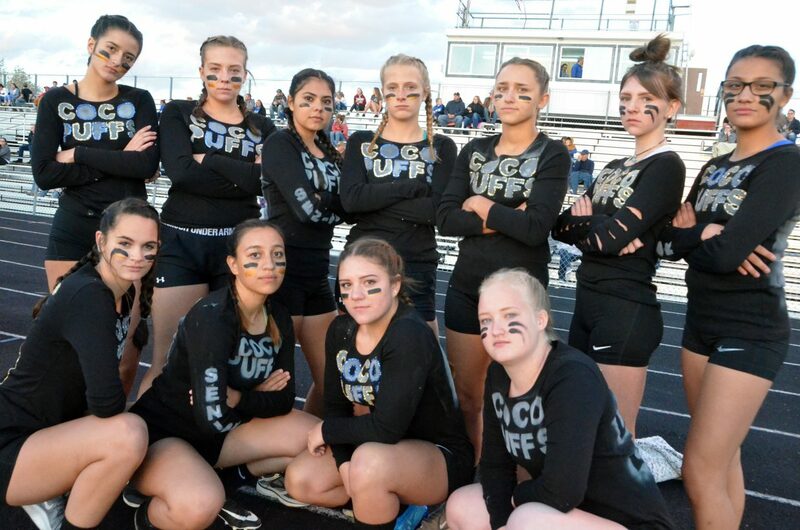 Coco Puffs players get their game faces on before Moffat County High School's Monday Powder Puff Football. 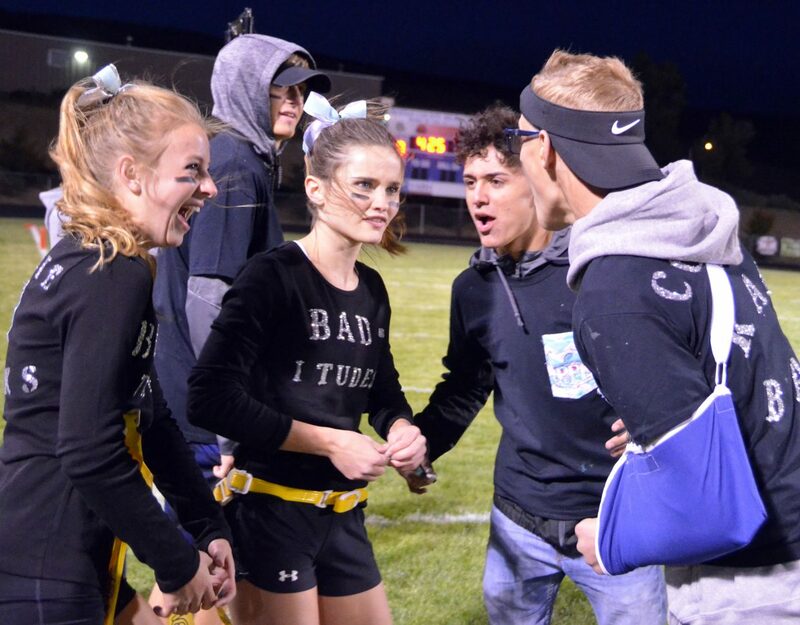 Bad-Itudes coaches Dario Alexander and Kameron Baker have a heated discussion with players during Moffat County High School's Monday Powder Puff Football. 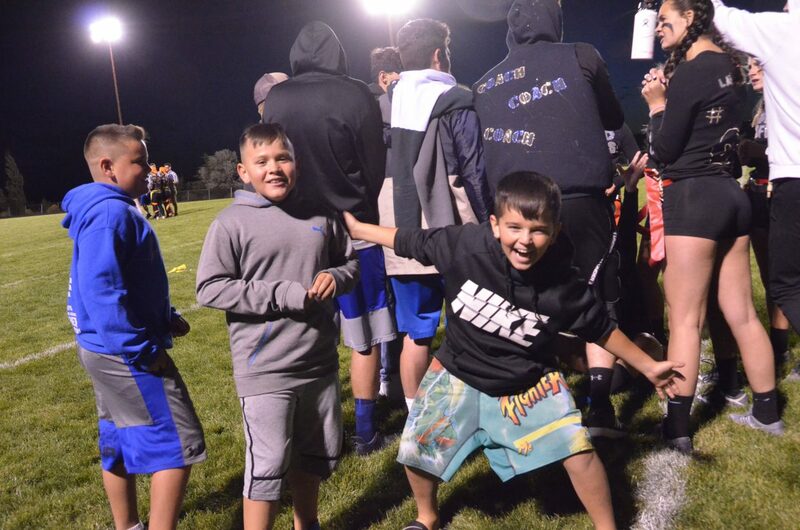 Young fans crash the Coco Puffs huddle during Moffat County High School's Monday Powder Puff Football. 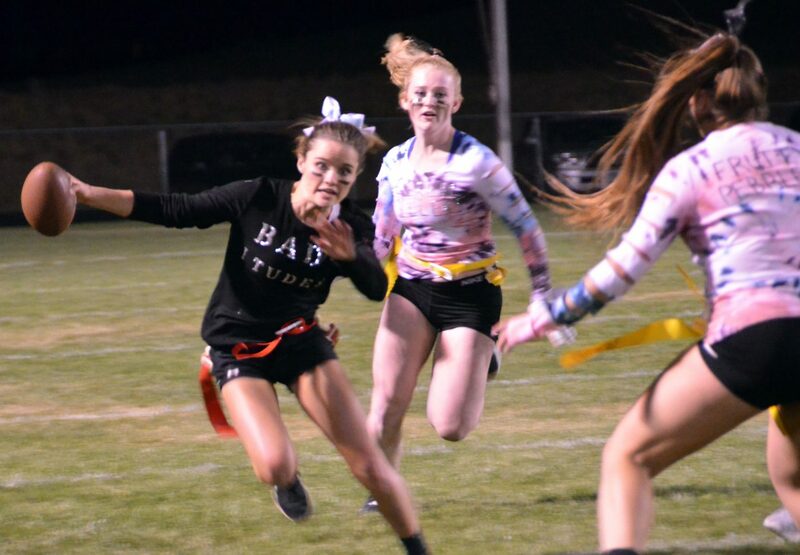 Bad-Itudes' Halle Hamilton avoids Cereal Killers defense during Moffat County High School's Monday Powder Puff Football. 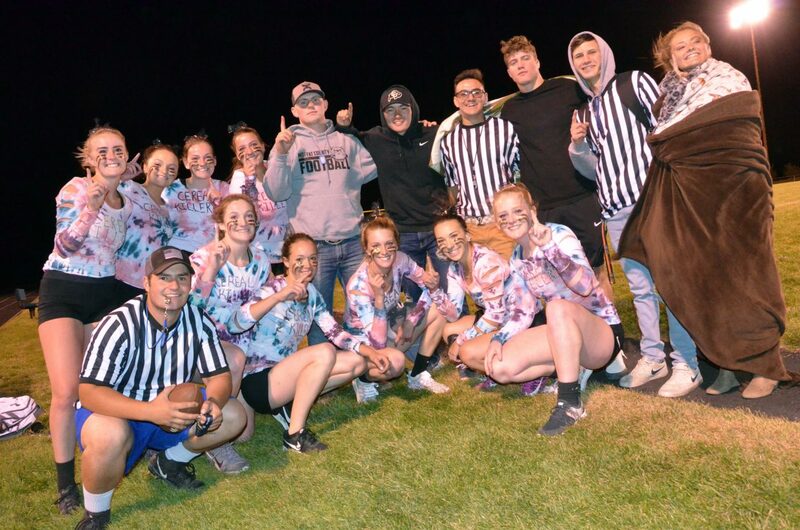 The last group standing in the latest rendition of Moffat County High School’s annual Powder Puff Football tournament may have had the most sugary name, but make no mistake, they were anything but sweet in handling their opponents. 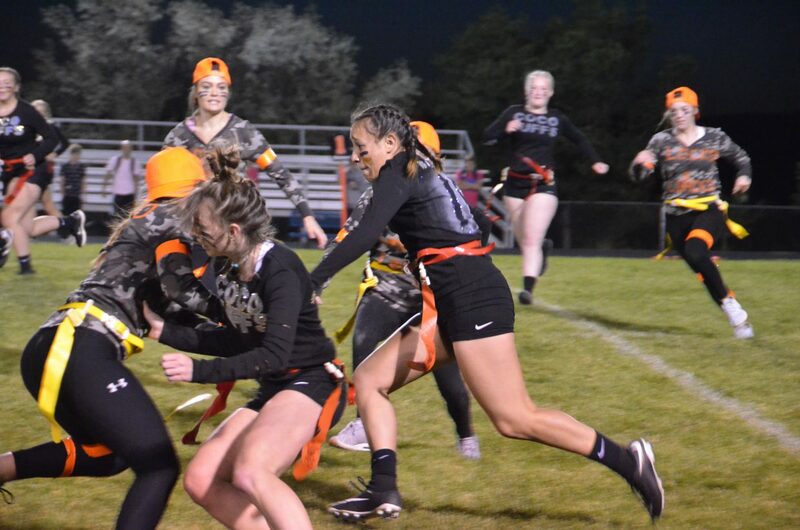 The yearly Homecoming week trip to the gridiron for MCHS ladies proved as hard-hitting as ever as four teams took to the Bulldog Proving Grounds for fast-moving flag football and bragging rights for the rest of the year. Taking the top honors were the Cereal Killers, taking their cue from the theme “A Spoonful of Homecoming,” finishing the night with a 14-7 victory against the Bad-Itudes. 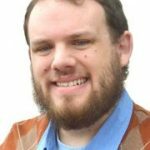 The roster of players each had an alias that was part of a balanced breakfast: Tiffany Hildebrandt (Cap’n Crunch), Madie Weber (Cinnamon Toast Crunch), Bailey Lawton (Lucky Charm), Terry Gillett (Trixster), Jaidyn Steele (Mini-Wheat), Quinn Pinnt (Frosted Flake), Kinlie Brennise (Special K) and Ebawnee Smercina (Fruity Pebble). 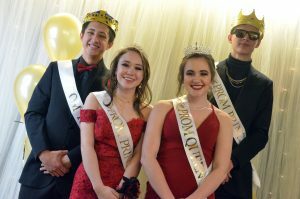 As the only junior among seniors, Faith Morgan had slim pickings with a lot of cereal names spoken for, though she was still happy with her nickname: Froot Loop. “I got the leftovers,” she laughed. 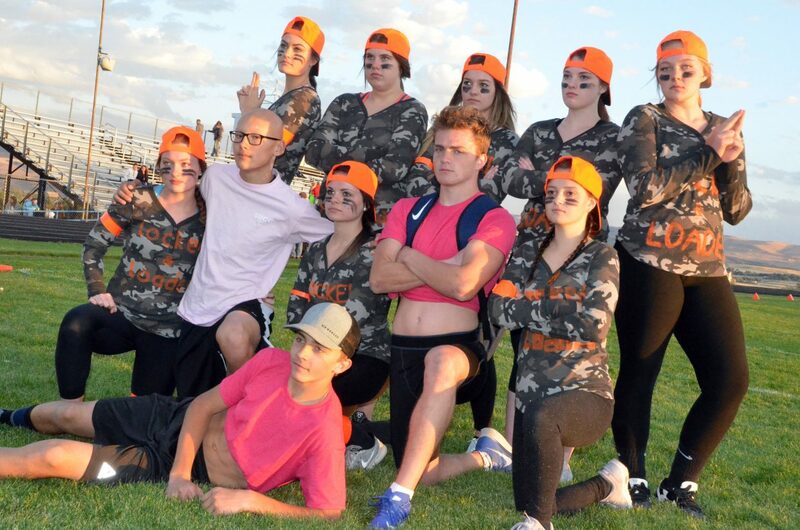 Fellow team Coco Puffs also followed suit with the theme, while Locked & Loaded went with their own style, namely uniforms of camo tops and orange hunter hats, which weren’t staying on their heads as an evening breeze hit the field. 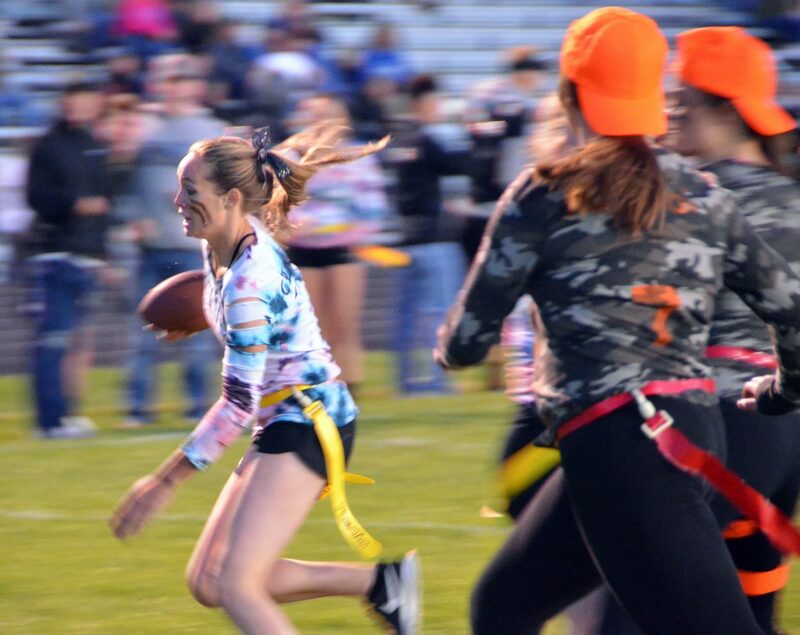 With coaching by MCHS varsity football players, girls enacted the trick plays that would rarely fly in most games, like the hidden ball play or a double reverse, both of which worked well to gain big yardage. Still, most moments came from the tried-and-true run game with the occasional passing, though turnovers were frequent. 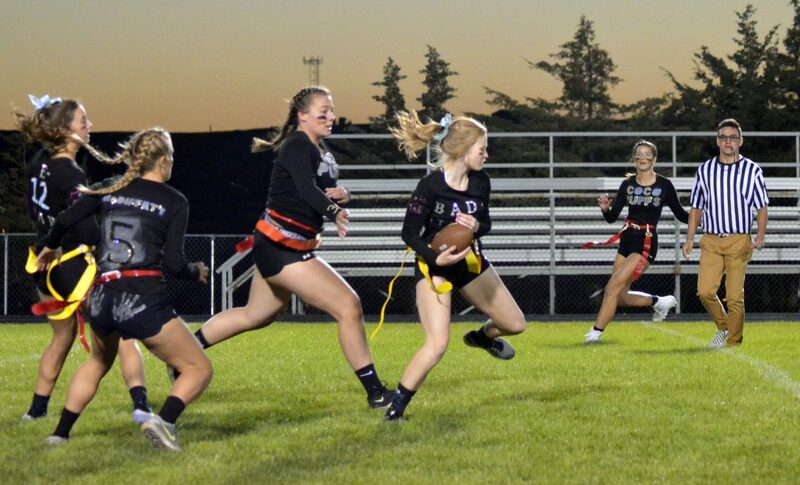 Reese Weber helped clinch a first-round win for the Bad-Itudes over Coco Puffs with an interception, the first time in the Powder Puff ranks for the freshman. 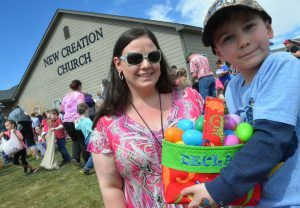 “I was really nervous at first, but once we got going I felt comfortable and knew what I had to do,” she said. She also faced off with older sister Madie, the Cereal Killers’ quarterback, in the championship round, but nether was taking it easy on the other. 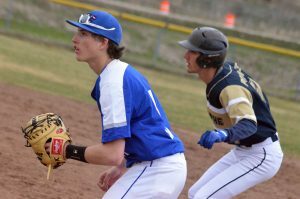 “It’s just fun for us to have that tough competition with each other,” Reese said. While coaches tended to escalate the energy of the night with disputes with refs, players focused on keeping the game fun. “I see why boys love it so much,” Hildebrandt said.